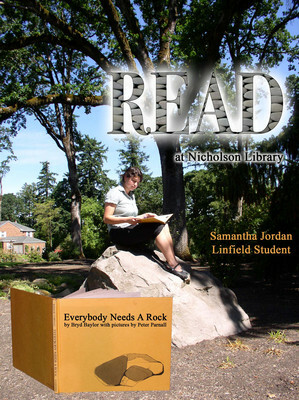 Samantha Jordan, Linfield student, reading Everybody Needs A Rock, by Byrd Baylor, with pictures by Peter Parnall. Terry, Paula and Nicholson Library Staff, "Samantha Jordan READ Poster" (2008). READ Poster Gallery. Image. Submission 38.